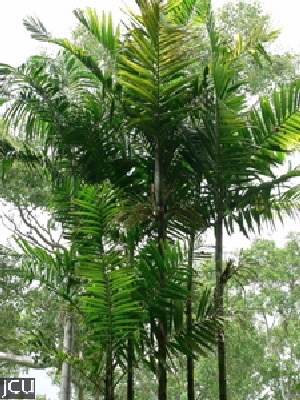 This Queensland and New Guinea palm is usually found as a clumping palm, but very infrequently it may have only a single trunk. Annular rings are prominent. The leaves are pinnate to 2 m long and the terminal pair of pinnae are basally fused. Fruit bright red to 2 cm long.